It’s that time of year where we start to analyze the 2018 season and see what players are going to be climbing up or falling down draft boards in 2019. I’ll be going through position by position to find guys I expect to be risers and fallers, or the guys I think you should know about as you gear up for drafts and trades during this non-existent off-season. What better way to start than with the most non-existent position, catcher. There’s plenty of muck and disappointment at catcher, but there’s a lot of promising young talent as well. 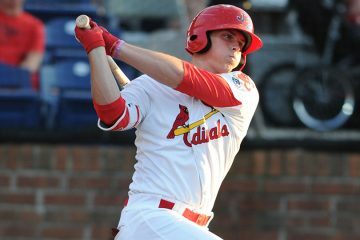 You’ll notice a few young catching prospects in this article, and that’s because there’s a ton of emerging potential here as well. Within the next couple years, we may go from a barren wasteland to a cornucopia of good catching options. 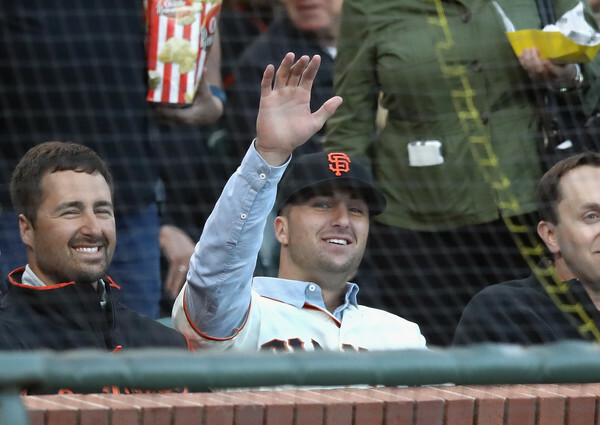 Selected number two in the 2018 draft by the San Francisco Giants, Joey Bart looks the part of a high first-round draft pick. Prior to the draft, Bart was praised for his defensive skills behind the plate and his ability to hit for power to all fields. The major concern was his lack of plate discipline, but the young catcher showed very few signs of that in his professional debut. Bart straight-up smashed in his short time between Rookie-Ball and Low-A. The power was on full display as he managed to smack 13 homers in a mere 228 plate appearances. That’s certainly one way to make an impression on an organization and its fans. The plate discipline looked alright as well, walking 5.9% and striking out less than 20% of the time in Low-A. While the power is clearly here to stay, I’ll be keeping an eye on the plate skills as he advances and takes on better pitchers and specifically worthwhile secondary offerings. Still, possession of all-fields power, a strong likelihood of sticking behind the plate, and a hell of a performance in his first glimpse in the minors means Bart should be ranked aggressively and taken in the first five picks of first-year player drafts. The 23-year old catcher had a dramatic change of stock the previous two years. Coming off 2016, not many were looking at Jansen as a legitimate catching prospect. That all changed once he started wearing sports-glasses. The opposite of movie magic when taking off glasses to become more attractive, Jansen put his glasses on and looked fine as hell. Regardless of the ultimate cause of Jansen’s turn-around, the catcher went from posting strong plate ratios with very little average, on-base percentage, or power to doing all of those things quite well. Since he’s donned his glasses he has posted averages closer to .300 than his usual .200 and strong ISOs, all across multiple levels. Those multiple levels now include the majors, where he batted .247/.347/.432 in 95 plate appearances with three homers. You might not be blown away by that slash line, but remember that it was his first cup of coffee. Rogers’ Center is a fantastic ballpark to hit dingers in (see the entire Blue Jays Lineup), and Jansen’s newly displayed skill-set deserves our attention. Keep an eye on his exit velocity and hard hit data as he wasn’t hitting the ball with too much authority in his short stint in the majors last year. My man! I’ve written about Varsho recently, and all my prior analysis holds true. I’m not generally into catching prospects (this list notwithstanding), but I can’t get enough of the power-speed combo that Varsho offers. Taking a look at his stat line, there’s the captivating 12 homers and 19 steals, but what’s even more impressive is that he did this in a season where he suffered injury (a hamate injury in June, vanquishing his power for the remainder of the season). Now might be an excellent time to buy low on the young catcher. The injury clearly zapped his power as he only hit three dingers upon his return, and while the numbers are still impressive they aren’t what they could have been in a healthy season. Keep an eye on him–and specifically his slugging and dingers–during his time playing in the Arizona Fall League. It’s encouraging that Varsho is back and playing, as he won’t have missed large amounts of time that may screw with his development. However, it would be nice to have a little more reassurance that the hamate injury has subsided. 2018 served as a kind of resurrection for Grandal. 2017 saw the offensive catcher projected as a future backup to Austin Barnes. Grandal had different plans: he increased his walk from 8.3% to 13.9%, resulting in an increase in the catcher’s OBP from .308 to .349. He also started hitting the ball with more authority, raising his ISO from .212 to .225, and his exit velocity by a mile-per-hour. How did he do it? What appears to be the biggest contributor for Grandal’s resurrection is his pitch selection. Specifically, laying off offspeed pitches helped him get the pitches he wanted. In 2018, Grandal lowered his whiff-rate on offspeed pitches by 14.6%, that’s a helluva difference. 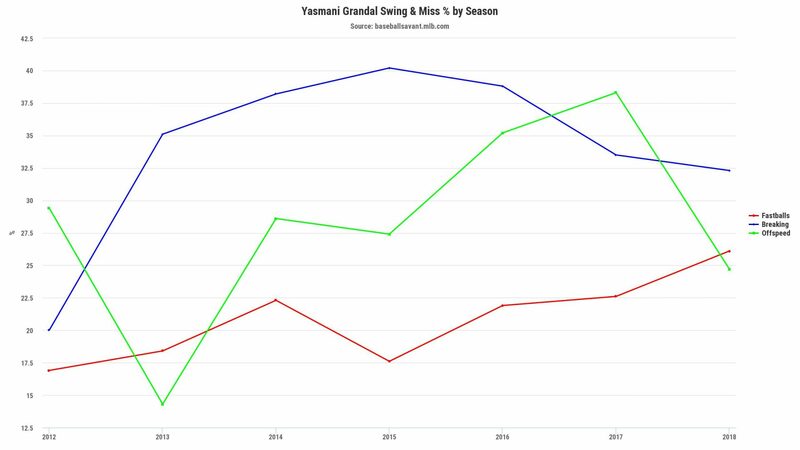 Less swinging at strikes, less swinging at non-strikes, and driving the pitches he got resulted in a much better version of Grandal (2.5 WAR 2017, 3.9 WAR 2018). At the age of 29, you might be better off selling when Grandal’s stock is high rather than waiting for him to reach his inevitable decline. Those of you competing in the next few years could do much worse at this position than to secure Grandal’s services. I believe Grandal can grow old as a productive, patient, power hitting catcher. Go get him if you’re in it right now, but otherwise sell. Ronaldo continued his impressive ascent through the minors, when he bashed 21 homers from the catcher position at the age of 20 years old. When watching footage of him hitting the first thing I notice is his ability to use quick wrists when handling pitches on the inner part of the plate. It’s a spectacular tool to own at such a young age, and it helps explain why he’s pulled the ball near 50% in the first four years. Those hands and that swing make a lot of contact as well, striking out below 16% in each of his minor league seasons. Combine that with a decent walk rate and you’ve got a hitter with an advanced approach for his age and level. The former infielder has raked and ranked highly in each of the leagues he’s been assigned to thus far. While raking is all we care about for most of our intents and purposes, there’s the importance of whether Hernandez will stick behind the plate or not. The reports on his defense have been positive, and he’s been scouted as having a plus-plus arm. That’s encouraging for those of us desperately seeking more than a warm body behind the plate. So while Rays prospects like Nate Lowe, Brandon Lowe, Brent Honeywell, and others may be garnering the attention of dynasty owners–and with good reason–a sneaky play would be to grab Ronaldo now before the hype starts to catch up with his potential. I’d expect him to see Double-A by the end of next season, and that means there’s a chance for a call-up in 2020. I’m grabbing him wherever I can. Before you start yelling at your computer, this faller is relative. Posey has occupied the top of catcher rankings for a long time until that darling Gary Sanchez came around. Observing Posey’s stat line, it’s easy to see a catcher who’s in decline. While he still provides value in ratio categories, the power we once knew and loved isn’t coming back. However, you can do much worse than to roster Posey behind the plate. Again, while Posey is going to fall in our rankings, he’ll likely remain inside the top ten at catcher. Despite a handful of injury problems in 2018 (including a concussion), the outlook for position eligibility still looks strong for Posey as he’s continuing to play the vast majority of time behind the dish. That’s likely to continue until the emergence of Joey Bart, or the end of his contract in 2022. If there’s a league where an owner is jumping ship, consider that Posey should provide you decent ratios behind the plate for years to come. Just don’t expect a rebound to the elite catcher of old, instead expect an old, still near-elite catcher. After bouncing between the minors and majors since 2013, it’s time to close the book on all the upside we once dreamed of with Zunino. With a career ISO of .199 we know the twenty-seven-year-old catcher is strong, but he also swings and misses a lot, and it really hasn’t gotten much better with more time in the majors. In 2018 Zunino hit all sorts of new lows, including a career-high strikeout percentage (37.0%), and slashing .201/.259/.410. We can describe his 2018 season in one word: ugly. Dynasty owners can count on the power from Zunino, but there’s truly no other positive category from the Seattle backstop. He embodies the current state of catcher, where owners will literally take any positive they can get from the position. Having 20-25 homers in the bank is nice and all, but a tremendous crop of catching prospects on their way, owners can do much better than Zunino in the near future. Sell him for pennies on the dollar. If you took a chance on this 23-year-old than you were most likely sorely disappointed. Scouting reports have talked about Sisco as a bat-first catcher, but that failed to come to fruition. Instead, we had a catcher that showed little plate discipline, little power, and not enough defense to warrant everyday starts. Not quite the debut all the scouting reports had led us to believe it would be. Lucky for Chance, the post-apocalyptic mess that is the Baltimore Orioles should ensure the catcher gets plenty more time behind the dish. The Orioles have finally committed to a rebuild, and while the seemingly ever-present Caleb Joseph shouldn’t block Chance for much longer, the ceiling here isn’t all that high either. The likely outcome is essentially Caleb Joseph, but with a better hit tool. He should post a decent OBP, a low but not completely draining average, and double digit pop. Chance’s stock is down, but not a bad stash or acquisition in super deep leagues. The Padres trading for Francisco Mejia means the writing is on the wall for Austin Hedges (not to mention the possibility of Austin Allen). 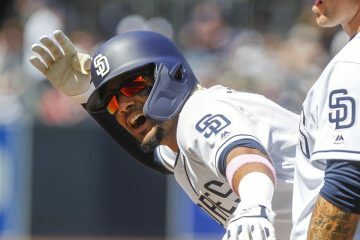 Praised for his hypnotic work behind the plate, the streaky power-hitting catcher just doesn’t appear to have the offensive chops to stick in the soon-to-be budding Padres lineup. Hedges now has almost a thousand plate appearances at the major league level and his career slash line is .210/.258/.378. Yuck! Lest you think that maybe there are some xStats or perhaps some Statcast data that indicate a change is coming for Hedges, I assure you there is not. Hedges owns an above league average launch angle, and that’s why he ends up with the streaks of power, but he doesn’t hit the ball hard enough for it to ever turn into anything significant. No plate discipline, not enough power, very little speed, and a serious chance he’s a backup catcher in the next season or so. No thanks. Turn back the clock to preseason 2018, and the TDG crew was ready to put Grandal in his dynasty casket and proclaim a new Dodgers’ everyday catcher. My co-host and good friend, Keaton O. Derocher wrote a delightful piece about all of the upside, but alas the Dodgers and Barnes had other plans for our pretend baseball hearts. The biggest problem? Playing time. In the pre-season, we thought he’d steal the job from Grandal, but that didn’t happen. That’s ok, the good news is that he’ll get plenty of at-bats playing second base. Oh wait, Max Muncy can destroy baseballs? Yep he can, and that also put a squeeze on Barnes playing time. In total, Barnes actually got fewer plate appearances than he did in 2017! However, there’s still some hope here with Barnes. Part of why he didn’t get the playing time we expected was that he was battling elbow pain in Spring Training. Thus, for part of the season, we can assume the young catcher wasn’t at 100%. This shows in his Statcast data as almost all of his indicators fell. Including his launch angle and exit velocity. So the intangibles we saw before–speed, on-base skills, a bit of pop, and multi-position eligibility–still remain a possibility for Barnes in 2019. Grandal is in the last year of his contract, and catching prospect Will Smith appears to be ready for the majors. There’s still the possibility that Barnes gets enough playing time to be relevant again in the next year or so. Buy, but only in the deepest of leagues. Thoughts on Willson Contreas? Do you think he was just getting tired? Man, 2018 was a really weird year for Contreas. Many of his numbers are right inline with his career norms. He swung at more pitches, and made less hard contact though. I’m wondering if it’s fatigue or possibly injury related. To me it seems like he wasn’t able to get around on pitches he normally would. His exit velocity plummeted late in the season, except on breaking balls. So he was able to get around on slower pitches, but still couldn’t catch up with the fastballs up in the zone. Everything else looks in line. My guess is their may have been an undisclosed injury, looks like a good buy low. Although his launch angle is so low that I don’t know if I’d expect 20+ homers out of him. Dude loves to hit the ball on the ground. Part of my wants to just answer this questions with a ¯\_(ツ)_/¯. Scouting reports all indicate that he has tremendous amount of athletic ability, but is he even going to play baseball, and what kind of impact does playing football this year have on his development. He’s not someone I”ll be targeting in leagues. Too much risk, maybe I miss out on an incredible career, but I’m worried. Catchers already fail often and generally take quite-a-long time to develop. Pass for me. Price will be too high come draft day. Thanks for this write up! My catcher was Evan Gattis this year, so now that he is ineligible I’m looking around for another guy. What do you think of Willians Astudillo? Do you think he’ll still be in a timeshare next year or might he get the job full time? He was doing so well in the last month that I actually jettisoned the suddenly useless Gattis. Not sure if he’s worth hanging onto or if I should consider the Grandal advice you gave. You’ve got a tricky situation on your hands there. Ultimately you need to play the player you are most going to enjoy watching/having on your team. I’m a big believer in “get your guy” even if that doesn’t mean winning the league. I’d much rather play guys that are fun for me than boring dudes that bring me a title. I understand that’s not everyones’ point of view. I can’t recommended Astudillo over Grandal, but I do think he is very fun and will get playing time. So my advice would def be to hold onto Grandal unless you can flip him for another piece. If this is an OBP league this choice is even easier. I’ll be looking to add Astudillo on my teams though, because his approach is so damn unique and he’s a blast to watch. Hope this helps, let me know if I can be of more help. Thanks for reading, it means a lot.